What problems are you encountering when trying to get your exhibits admitted into evidence? Do you have specific evidentiary issues or topics that you’d like me to address? Before I create a step-by-step manual for getting your evidence admitted, I need to know whether it’s something you’d be interested in and what topics you’d like me to address. Please do me a quick favor and take 30 seconds to let me know if you’d be interested (“Yes, I’m interested,” “Nope, not interested,” “I’d rather read about…”) so I’ll know it’s worthwhile, and then tell me what topics you’d like me to cover. Yes, how to get email and internet posting admitted. Love to have an easy to use manual on admitting exhibits. My partner definitely will benefit from it. This would be most helpful. Especially how to get personal and 3rd party e-mails admitted over Hearsay objections. Also interested in getting medical records admitted. This would be an excellent, excellent resource. I am also interested in how to get my medical records into evidence. Thank you. Yes, definitely interested. I want to introduce emails into evidence. what measures should i take to prove the authenticity and make the emails admissible. Thanks. Hi Elliott, definitely interested here. I read every one of your newsletters. Thanks for everything! When is this manual coming out? Not sure when I’ll have it done — I’ve been working on several other projects and looking for a new house, so it’s been a bit of a chaotic mess here behind the scenes! 🙂 I’ll email everyone on the Trial Tips Newsletter list as soon as it’s available! Yes, I’m interested as well. I have experience in getting 3D animation and sophisticated 2D graphics admitted as demonstrative evidence, but a more comprehensive manual would be truly helpful. I recently spoke with a judge in Los Angeles who said that she wouldn’t allow 3D animation if it wasn’t shared during the expert witness deposition, so I’m starting to see a lot more graphics presented early in pre-trial, which lays the foundation for such a trial graphic. Nothing is more frustrating than to have your case laid out properly and in your mind how each piece of evidence is going to be admitted and you get stopped in your tracks by some objection you can’t seem to overcome. It throws you off your game and its discouraging. When you get discouraged your confidence decreases and that is something no attorney wants during trial – not to mention the potential damage to your case because you didn’t get part of the evidence you needed admitted. A step by step guide/manual on how to get evidence properly and easily admitted is something we could all use. When will it be ready???? Definitely interested in the evidence manual. I think it would also be worthwhile to have an article, or more, on motions in limine, when you should file them versus waiting until trial, what types of subjects they should cover, and how to effectively present them. Yes, definitely interested. Your free objections manual is excellent so I am sure a how-to-get-evidence-admitted manual would be also. I loved the simple approach you set forth in your objections manual for application of the evidence rules — Is it relevant? Is it reliable? Is it right (to admit it)? Thanks! Yes, I’m interested! Evidence, or lack thereof, is an essential element of any litigation. Thank You for your willingness to share your knowledge and experience. Yes, very interesting indeed. As Kareen above, Im also from another jurisdiction far from the US. Yet I find the material interesting and more importantly practically applicable in my jurisdiction as well. Thanx Elliot. Yes. I am interested. Do not give up. You never know how many people you are helping! I would like information concerning the admission of medical records as evidence or exhibits. Often, one cannot obtain a witness to authenticate the records or they may contain hearsay information. Nevertheless, medical records may be relevant to an issue at trial. Thank you. Your help is sincerely appreciated. Yes I’m interested. Your content is always helpful. I like Sunny’s suggestion above. Interested indeed!and thanks to the pdf file of “The Art of Cross-Examination” good work as usual. Yes i’m very interested! And thanks for the great work you’re doing. I am also interested in a manual for getting evidence admitted. I am especially interested in the introduction of corroborative evidence in child abuse cases. For example, a child may recall the weather, a TV show, or other recorded event that I would like to be able to introduce into evidence to corroborate their testimony. Yes,I’m very much interested. Hope you could make it the soonest. I’m so eager and excited to browse and read it. Yes, very interested. Keep up the great work. I have been sharing your website with all my colleagues. Even the experienced ones are passing it around. I recently won my last 7 day jury trial using many of your great tips. I just put your entire system on my birthday list for my wife. I’m definitely interested. What would be good would be a comprehensive guide/checklist for common types of evidence, and ways to introduce/oppose such evidence. Your sharing is highly appreciated. Thank you very much. Yes, I’m interested. Especially medical records and bills. Although I’m a young lawyer from a different country, i find all your articles very helpful in my practice here in Philippines. The tips are useful because, except for the jury system, Philippine Rules of Court are basically the same. 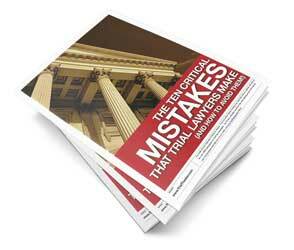 I read your Objection Manual and The 10 Critical Mistakes Trial Lawyers Make. I love it. Cant wait to read this upcoming manual on how to get the evidence admitted. I’m an avid fan! Definitely interested. Lets get this happening people! Yes, I’m definitely interested in how to get evidence admitted. Seems to be an increase in face book & my space pages being at issue in my cases. Appreciate your weekly tips they are a tremendous help! I am interested in a step-by-step manual for getting evidence admitted. Specific evidentiary foundations required by California courts would be of primary interest to me. Thanks. It would be helpful if you first reviewed General Rules of Evidence and commented on the ones that cause the most problems of admissibility. Then you could give your experience regarding overcoming objections from the other side, to any evidence that you presented. Are there any strategies to getting borderline evidence admitted? What about hearsay — when is it applicable? Keeping the jury awake through mountains of evidence is also a problem. Dealing with Juries would be a great essay in intself.